Obituary for Tristan da Cunha islander Mary Lavarello, who passed away 22nd of October 2017 in CapeTown, aged 82. We regret to announce the death of Mary Ann Lavarello, who passed away in Cape Town on the 22nd of October 2017, aged 82. She was born to parents Thomas and Victoria Glass (nee Swain) on the 8th January 1935, and was the eldest of three children. Mary married Gabriel Lavarello on 30th January 1957 and they had three children, Marion, Beverley and John. Mary worked as a processor for the fishing company and did a lot of community work, helping out in the Church as well. Mary loved helping people in any way she could. She loved cooking and was famous for her cakes and Jam puddings. 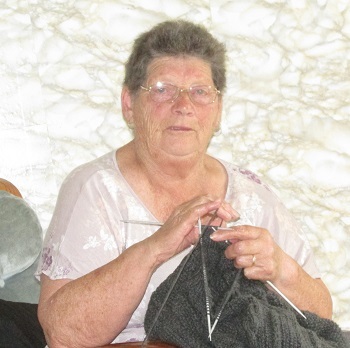 Mary especially loved knitting which she continued until she fell ill in late September 2017. Mary was a kind and loving person, and always greeted you with a warm, friendly smile. She will be greatly missed by all her family and friends on the Island as well as overseas. She is survived by her daughters Marion and Beverley, son John, sister Amy, Brother Roger, son-in-laws Christopher and Albert, daughter-in-law Vanessa, and by her grandchildren Cedric, Rhyanna, Patrick and Lynette. The family would like to thank all those who sent messages of sympathy during this sad time.